Get active for the Sava, Una, Sana, Vrbas, Bosna and Drina rivers! National NGO, Ekotim, hosted the Danube Art Master awards. In this annual competition, young people are challenged to think about why their rivers are important and convey their environmental messages in artworks and videos. Exciting prizes were awarded to the best artworks, with the first place winner receiving a tablet computer and the opportunity to go on to the international final later this year. Ekotim also led guided school trips to the spring of the Bosna river. 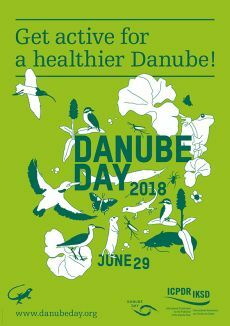 Learning about conserving water resources and the importance of maintaining wildlife diversity, the visits fostered a desire to protect rivers and the wider Danube Basin. To see how all the countries celebrated in 2018, go to Review 2018. Or revisit 15 years of Danube Day in Bosnia-Herzegovina via the general Review page. Nihada Hadžić of the Water Agency for Sava River District on +387 33 726 403; nihada.hadzic@voda.ba. Marija Licanin of the Water Agency for Sava River District on +387 52 240 330; mlicanin@voders.org. Danube Art Master: Rijad Tikvesa of Ekotim - Association for the Protection and Advancement of Environment, Nature and Health on +387 33 812 515; mobile: +387 61 554 302; ekotim@bih.net.ba; rijad@ekotim.net; dam@ekotim.net.